I’ve adapted this recipe (beyond recognition really) from a Nigella recipe in the wonderful How to be a Domestic Goddess. Nigella, of course, uses booze and extra sugar, but I wanted a more modest cake. Not that there’s anything wrong with rum or sugar but I am attempting to eat healthily, post baby. Therefore, homemade cake. Ahem. Even with less sugar the cake is gorgeously sweet and moist thanks to the bananas and dates. o Bake for an hour in the middle of the oven. May I have more luck with Banana bread! Hmmm, not sure what happened with your muffins, Lis. If you're not vegan, try using an egg instead of NoEgg. That might help? 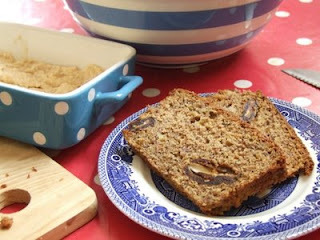 Same with the banana cake - real eggs do work better if you are not averse to them. Hope the banana cake turns out nice for you!